edit2: fixed a minor bug I noticed thanks to marxav: it didn't strip the version number from the dependencies. I am really liking this script. I will bump it on the pacman-dev list now to get comments on how provides should best be handled so this can be included with the pacman 3.2 release in the next week or so. I think you can see the problem there! Also, currently the depth limiter requires a space in the parameter list (pactree -d 2 blah). That took me a while to figure out as I kept trying "pactree -d2 blah". Anyway you can get both to work? I wanted to add that, but I thought it was too hard. In the end it wasn't. With you, sir, I doubled the userbase! If this trend keeps going, in a month more than a billion people will be using this script! You are very enthusiastic LOL. I did something similar a few weeks ago, except it uses graphviz to generate an imagefile of the dependency graph. it will generate the file pacman.deps.png in the current directory that looks like this. Not sure if this has been fixed or not, but I noticed it isn't handling the terminal colors quite right. 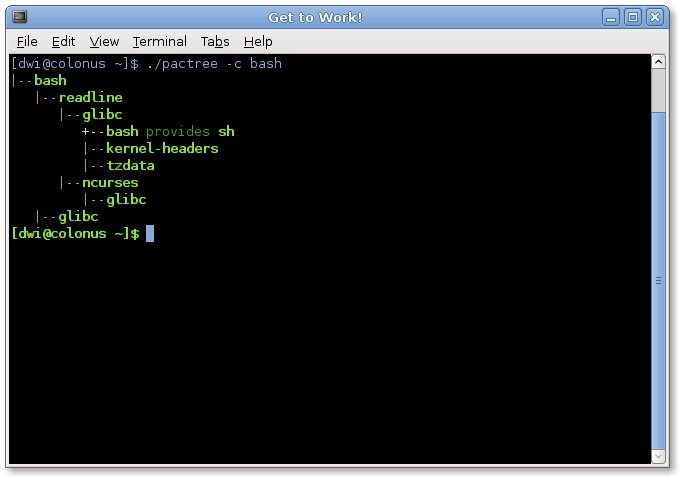 After I run it, my default terminal color has changed. You are right: as I set the prompt colors in the PS1 variable I never experienced this problem. echo -ne '\033[0m' # return colors to normal? at the end of the script which should do the trick. I added the graphviz support. You can edit the colors at the beginning of the script. Here's an example: the kopete dependency tree! I just had an idea. If I wanted to run pactree on a package that is not installed yet so I have an idea as to what the installation involves in terms of dependencies. Very nice, I wrote something similar once but it wasn't very good. Nice work! Do you mind if I distribute this tool with my pkgtools package in AUR? You will of course be given full credit, and if you like, I can set you up with push access to my github repo for it. Hey! I have already flagged this for inclusion in pacman's contrib section and thus in the pacman-contrib package. No stealing! I approve of this idea! It is easy to implement too, although the way I wrote the script, which I considered fancy and smart in the beginning, begins to show its inherent limitations. I had a nice idea for a pacfix script and parsing the package versions and names for a cleaning cache script is so impossible my mind is blown away. man this is such a helpful piece of work..another set of thanks from me! Can be done... Just send stuff to the pacman-dev list and its inclusion gets discussed there. Someone already submitted a pacfile/pkgfile script which hasn't made the main codebase yet. I will probably include one in the next pacman-contrib release anyway. Do you still plan to have this included in 3.2 source tarball? Yes, carlocci is going to submit the latest version as a patch.... aren't you! If it doesn't make it in time, I will stick it into pacman-contrib package anyway. Still, it would be preferable to end up in the tarball.